When OHUG opened its doors in 2007, lines companies were designing and maintaining their networks with a core set of products that had generally stood the test of time. OHUG directors Steve Rigby and Nanette Russell knew from attending power industry conferences overseas that there were a lot of new products and techniques that were not seeing the light of day in New Zealand, and set about building a product supply company that would bring a number of these innovations to the New Zealand market. 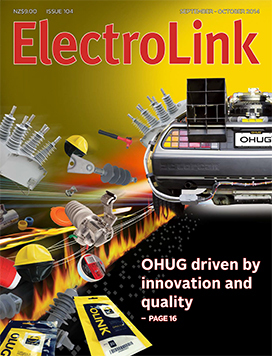 Now seven years later OHUG is supplying many ranges of different products to the power distribution industry and has introduced new technologies to advance the performance and reliability of a growing number of networks throughout the country. At the heart of the electrical safety legislation lies an opportunity to turn the regulatory approach to compliance on its head. For years the best-practice approach to legislation has been a punishment-only approach to incentivising compliance and no consideration has been given to harnessing market forces to improve the performance of the electrical contracting industry. An increasing raft of compliance demands over recent years and tighter strictures on testing and certification have been driven by regulators tasked with increasing the safety of the public, but little thought has been given to how effective the ‘crime and punishment’ approach will be at raising the level of safety delivery across the electrical industry. Shockwaves and heat caused by cavitating pumps can damage not just impellers and equipment but also the precious liquids being pumped by food and beverage manufacturers. To safeguard these liquid products during processing, ABB has developed sophisticated protection algorithms within its highly capable variable speed drive – the ACS880. Among its considerable range of process capabilities, the ACS880 will pump liquids at an optimum speed and flow while adjusting instantly and automatically to any change in flow or draining vortex which may cause the onset of cavitation. 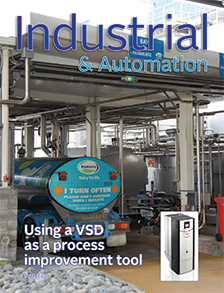 The review and update of 21 of the 26 ISO, EN and IEC machinery safety standards within AS 4024 will provide New Zealand manufacturers and OEMs with access to the most up-to-date international machine safety standards within a single standards binder. Last reviewed in 2006, the updated AS 4024 standards now includes the latest international best practice EN ISO and IEC machine safety standards. Originally published as an Australian-only standard, the revised 4024 standards will be published as a joint AS/NZS standard. This is scheduled to occur within the next three months. The first of a new range of LED domestic fittings has now been launched by HPM to provide electrical contractors with efficient, affordable, dimmer-compatible lighting. 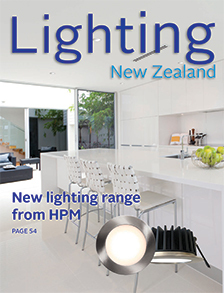 Hailing the new luminaires as a breakthrough for the wiring accessories company, HPM Legrand country manager Jeff Butler says the new LED fixtures extend the range of HPM products electrical contractors can offer clients, with absolute confidence in their performance. Automated wireless lighting control was once considered the domain of high-end lighting installations but rapid development of ‘smart’ LED lamp technology is providing residential consumers with similar levels of lighting control at a fraction of the cost of traditional automated solutions. Considered a fad just two years ago, ‘smart’ LED lamp technology is being taken seriously by some of the biggest lighting names in the business including Philips, GE, Samsung, Osram Sylvania and LG as well as a number of ‘start-ups’ focusing solely on wireless LED lamp technology. How good are LED retrofit lamps? The increasing range and availability of integrated LED replacement ‘light bulbs’ is providing simple plug-and-play solutions for energy efficient lighting, but do LED lamp replacements measure up in key areas of lighting performance? It is a question that electrical contractors need to consider with a plethora of retrofittable LED lamp options now available for almost every lighting application – and offering lower-cost upgrades to LED than installing dedicated LED fittings.